The ads on this module are sorted in a descending way. So, for example, for the Latest Ads type, the latest added will be on top of the list, the one before it will be 2nd and so on. Note that you can copy the module so that you can display more types at the same time. 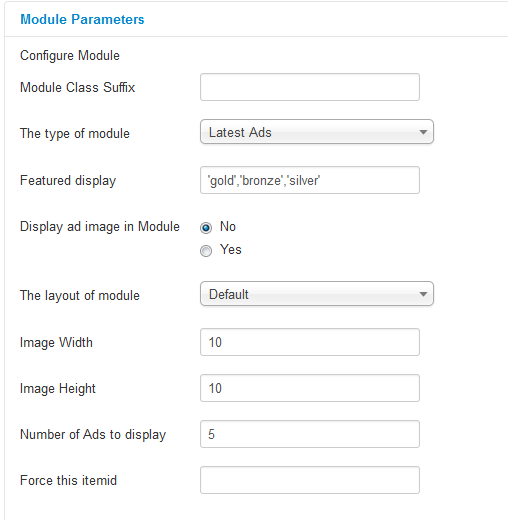 On the backend, you can configure the module by choosing the Type of ads to be displayed and the format. In case you selected Featured Ads, you can choose which ones of the 3 featured ads (Gold, Silver, Bronze) to be displayed on the list. You can change the format of the lists by selecting The layout of module to either Default or Details. The later one will add a short description of the ads next to their names. For a better preview of the ads, you can enable Display ad image in Module and choose the width and height of the images. 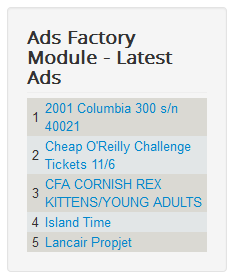 You can also select the Number of Ads to be displayed by the module. 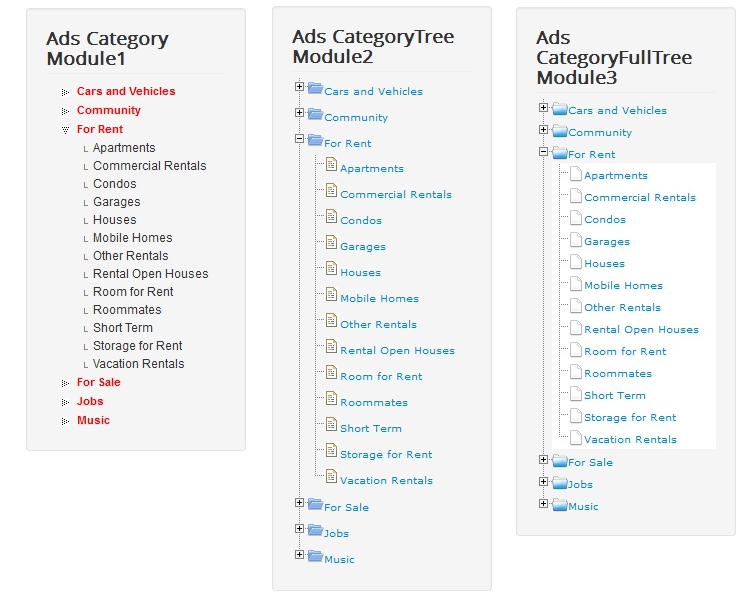 There are 3 modules available which will display expandable category trees. If enabled, it helps users find ads from specific categories more easily. Clicking on a category or subcategory will perform a search for all the active ads on that category/subcategory. On the backend, you can enable a Category Counter for each one of the modules. This counter will display (between brackets) how many ads are available for each separate category. For the 3rd module, you will find additional settings. Here, besides the category counter, you can also enable a subcategories counter. Set the Folding speed of the tree in milliseconds when expanding or simplifying the categories. 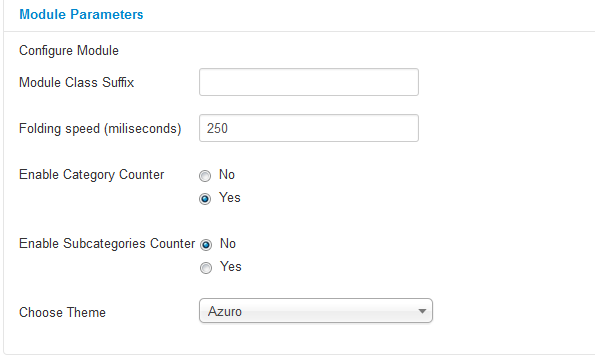 Choose Theme allows you to select one of the three available themes for this module: Default, Azuro or Green. This module provides a simple way for users to search after certain ads. It comes with one text field and a search button. The searches performed on it are based on the ad's titles. 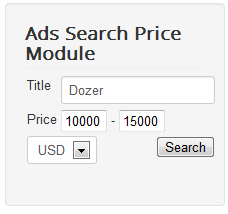 With this module users can search for ads within specific price ranges by adding a minimum and a maximum limit along the usual title search. Depending on the backend configuration, users can also select the currency used when performing the search. 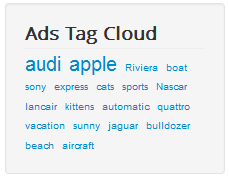 Tag Cloud module generates a cloud containing the most frequent ads tags. The size of the words represents their usage. Bigger ones are the most used while small ones are less used. Clicking on one of them will perform a search for ads which contains the respective tag. 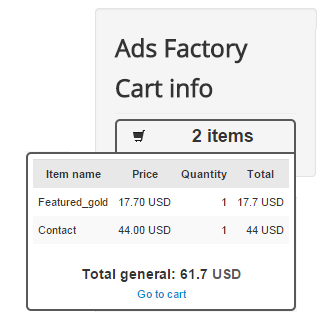 A new feature for Ads Factory is the addition of the Shopping Cart. With it, users can pay multiple payment items at once, such as pay per contact, pay for featured auction, credits offers or package offers. For more information about all these payment items please check our Ads Factory - Payment Plugins Guide.